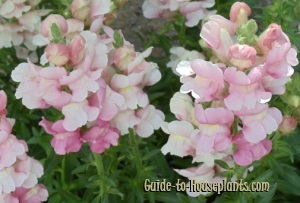 Dwarf varieties of snapdragon flowers are easy to grow indoors all year long. These compact, low-growing snaps are ideal for patio containers, too -- or window boxes and front-of-the-border garden beds. There are rare trailing snapdragons, perfect for hanging baskets. Clusters of colorful blooms grow on upright flower spikes and are available in almost every color imaginable, including bicolors. Dwarfs include 'Magic Carpet' with the traditional pouched bloom, and 'Twinny' with open, ruffled petals. Pinch your plants when stems are 2 to 4 inches tall to promote branching. You'll get more compact plants this way...and more flower spikes. Also deadhead spent flowers to encourage more blooms. Shed some light to make snapdragon flowers bloom. Give them as much full sun as you can indoors, setting them directly in front of a sunny window or in a sunroom. Outdoors, snaps will tolerate partial shade. Keep them cool. Snaps thrive in cool weather, giving the best show of blooms in spring and fall. Snapdragons are tender perennials yet treated as annuals. You'll enjoy a spectacular year of flowers before they start to fade. Plan to sow new seeds every year for the best show of flowers. Look for dwarf varieties of Antirrhinum majus for indoor growing. 'Magic Carpet' reaches just 6 inches (15 cm) tall. 'Twinny' varieties are 12 inches (30 cm) high. Water: Water thoroughly and often to keep potting mix constantly moist. Use a pot with a drainage hole to prevent root rot. Humidity: Average room humidity (around 40% relative humidity). If indoor air is dry, try one of these easy ways to increase humidity for your snapdragons. 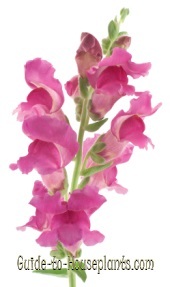 Temperature: Snapdragons thrive in cool to moderate temperatures (60-75°F/16-24°C). If you choose to grow them outdoors, it's a good idea to harden off the seedlings before moving them outside in early spring. Snapdragons will tolerate light frost. Soil: Good-quality potting mix with added perlite. I use 3 parts mix to 1 part perlite for most garden plant containers. Propagation: Sow snapdragon seeds indoors 6 weeks before last frost date if transferring them outdoors. (They will tolerate light frost if you make the move a gradual one.) Use a sterile seed starting mix, barely covering seeds (they need light to germinate). Keep medium moist, but not soggy at 65-70°F/18-21°C. You can expect to see seedlings poking up in about 10-12 days.